OK, here’s the story behind this. I first sent the image in the story to Ximena. There’s something about the posture and look on this woman’s face that’s just irresistible. Ximena thought so too and sent me a story right back. She then said wanted to see what I would come up with. I wish I hadn’t read Ximena’s story, but since I have you’ll notice that some of her inspiration rubbed off on me. “I have been detained by a most delightful preparation.” Piquot absentmindedly straightens his powder blue frock coat. He crosses the short distance to M. du Châtelet and falls to both knees. The fine powder of his wig dusts his shoulders. The young maid curtsies, uncertainly. Her mistress has not excused her. She backs against the thick velvet arras that is the fourth wall of the room. The two halves of the arras met just where she stands. If she backs just a little further, she can vanish through the safety of the thick fabric. She waits for the merest glance. “Why do you kneel?” M. du Châtelet asks. “No, Madame. Madame, pardone!” The girl tries not to bat at the hands behind her, holding her hips through the arras. “Villanelle Madame –” Piquot interjects. “He pierces me, Madame!” She holds her breath as though she had been pinched. Her knees lock together and she presses her hands to her belly. “Yes, Madame.” The young maid straightens though her slender back remains arched. “But Madame!” the girl pleads. “Oh Madame –” The young maid shudders and her eyes roll. “Madame, please but allow me; I will explain –” M. Piquot interjects. “Ah,” says Madame du Châtelet. The girl bites her lips as the apothecary speaks. “Of course, Madame.” The tall youth, with exaggerated flourish, crosses the room and places the fard on the Madame’s coiffeuse. As he leaves, he pauses before the young maid. He smiles. He presses his thumb gently at her lower lip as she gazes up at him. “I will assure your madame that your service to me is most exquisite.” The girl, still gazing up at him, curtsies and blushes. Then he presses his thumb between her lips and they close roundly about it. When he withdraws his thumb, her young lips part and her tongue follows. A pearling string saliva follows the pad of his finger until it breaks and moistens her chin. “You are moist above and below.” The girl blushes. He smiles. “I will inform the Madame that I will require your regular assistance in the production of the Madame’s fard.” The young maid curtsies again. 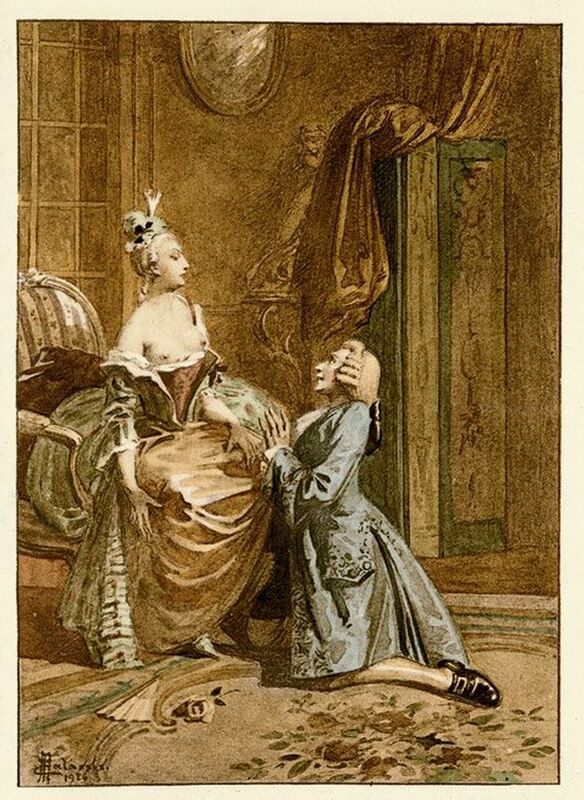 “You are most familiar with my maid, Sir,” says Madame du Châtelet. The youth bows deeply. “I am,” he pauses, “in need of such services as this maid will provide.” He smiles, sniffs his kerchief, and leaves. You know. I’ve sat with your comment for what, two? — three days now? — and I still don’t know how to interpret it. ;) Touche! Well now I’m hesitant to clarify for fear of ruining all the fun. I will merely comment then that it does indeed seem like “Ximena’s influence” rubbed itself off on you. Vigorously. oh gods, Will….that was totally fun, a sin-filled farce of delightful measure!